Austin Cluetivity combines the best elements of a classic treasure hunt, GPS-Geocaching and Live-Escape-Games with Augmented Reality Technology into a new INDOOR team game. 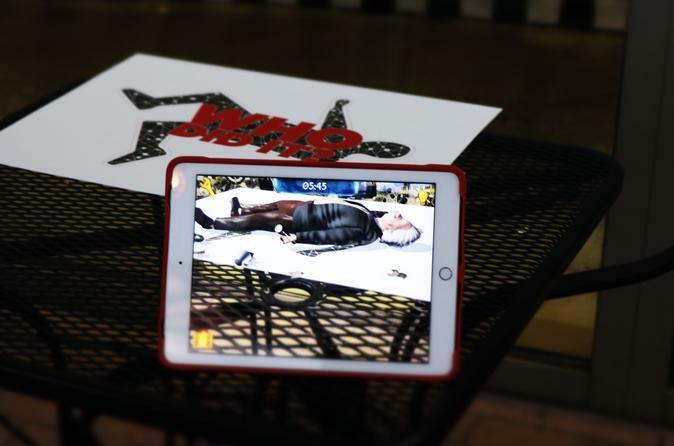 The basic game play is simple: Use your iPad to analyze a virtual crime scene where you will use a chalked outline symbol of a body to see Einstein’s crime scene. The object is to guess from a list of options how Einstein died based upon the clues given in the game. But the adventure and fun doesn't stop there next you have to stop Spider Technologies..... The secret research company Spider Technologies has already infected 20% of the world's population with a mind-control virus. Your task: Find the antidote by Dr. Bergmann, get access to the main server and prevent the disaster! Make sure you fuel up with some "berry yummy froyo before you go save the the world from the evil Spider Tech!